Synopsis: A Farmhouse in the Rain is a novel of war and peace, crime and punishment, love and loss, and eventually hope. It's a saga of three American soldiers and the women they love - before, during, and after World War II. About the Author: Before he wrote novels and short stories, Joe Kilgore created television, radio, newspaper and magazine advertising for some of the world’s largest corporations. Over the years his commercials and ads have been honored with local, regional, national and international awards. He has created and produced advertising in the USA, England, France, Holland, Brazil, New Zealand, Austrailia, Mexico and Saudi, Arabia. A Texan by birth and the father of three, Joe currently resides in Austin with his wife, Claudia, an accomplished artist. Also on hand is their French Bulldog, assorted cats, plus uninvited squirrels, geese, and deer who frequently wander by. From advertising to fiction, which some might say are virtually the same. Joe’s short stories have won awards and been featured in creative journals, anthologies, magazines, and online literary publications. Joe’s blog, The Fiction Fortune Hunter, reviews novels and authors he feels are worthy of second, third or even more looks. To date, Joe has authored four published novels; THE BLUNDER, published by Bridgeway Books in 2008, THE GOLDEN DANCER, published by Prize Fight Press in 2013, SIN AND SOMBREROS from Jezebel Publishing in 2014, and A FARMHOUSE IN THE RAIN published by Top Hat Books in 2016.
Review: Follow along the sides of 3 young soldiers, their sweethearts, and their families as they navigate the perils of WWII - both at home and abroad. 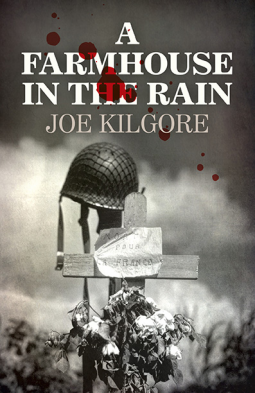 Although each comes from a different background, Joe Kilgore masterfully entwines the three central characters – young soldiers just trying to survive while on foreign soil and win the war. Unlike many war-time historical fiction we also get a peek into what life is like back home for those our intrepid would-be heroes left behind. Family, friends, lovers, all join to make a moving masterpiece that readers will be unable to put down. I highly recommend this for anyone who loves historical fiction, mysteries, drama, and star-crossed lovers.